February 13 2018 – Wow…. is all I want to say. It feels like the first of May here in Key West and all the forecasts are pointing to a warm month to the end. While the South East is basking in a warming trend we are experiencing some amazing fishing across the board here in Key West due to the unseasonably warm month. Windy… yes… But warm…. 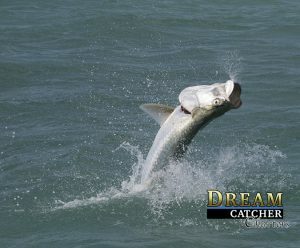 Tarpon jumps to try and toss the hook from my angler last week fishing in Key West. The tarpon fishing has been EPIC!…… Our guides here at Dream Catcher Charters have been batting at least a fish per trip if that is the focus. Also in the backcountry fishing there are a ton of trout, ladyfish, sharks, jacks and blue fish to keep an angler that likes to cast and catch allot very happy. Our 4 hour trips backcountry fishing have been without a doubt the way to go for a great time fishing. On the flats fishing I have seen some great stuff. I love February for permit fishing and this month is no different. my last day flats fishing a few days ago reaped my anglers 9 good shots at separate tailing permit. The 20+ mph winds were a huge hassle but my anglers were diligent and made it happen. Barracudas laying on the white beds were also in great number. On the reef things have been a little off.. We have been running steady on the Reef fishing charters mixing it in with a stop at deep water wreck fishing and showing folks a good time. As the winds settle down it has been good. Snappers and mackerel on the top with the occasional kingfish. its been windy its been tough on folks not used to that sort of thing..
All in all its one of the more fun February fishing months I have seen in 10 years. The folks that have made it to Fishing in Key West have really enjoyed getting out of the snow. We have some room in our schedule for more for those that wish to go.. Give us a call.